For many local small businesses, integrated digital marketing, social media and search marketing are becoming more and more challenging and complicated. When you add numerous marketing terms, phrases and technical obstacles into the mix, some small businesses are left feeling a bit overwhelmed and stuck. This is understandable, given the ever-changing digital marketing climate that incorporates so many connected yet different platforms, tactics and mediums. As most businesses struggle to run their business and the substantial daily requirements that burden them, the taxing marketing question is always hanging overhead. What kind of online marketing should I do? How do I do digital marketing effectively? and of course what is integrated digital marketing and how should small business utilize it online to get results? Integrated digital marketing is the discipline of using multiple online marketing platforms and tactics at the same time, as a part of an overall strategy that leverages each component together with all the others to improve the net results. Integrated digital marketing is bringing everything together with a common message, purpose and strategy. How Do You Integrate Digital Marketing? At the core of integrated digital marketing is strategy. Simply having multiple social network accounts, a website and an email list you market to does not constitute integrated digital marketing by any means. 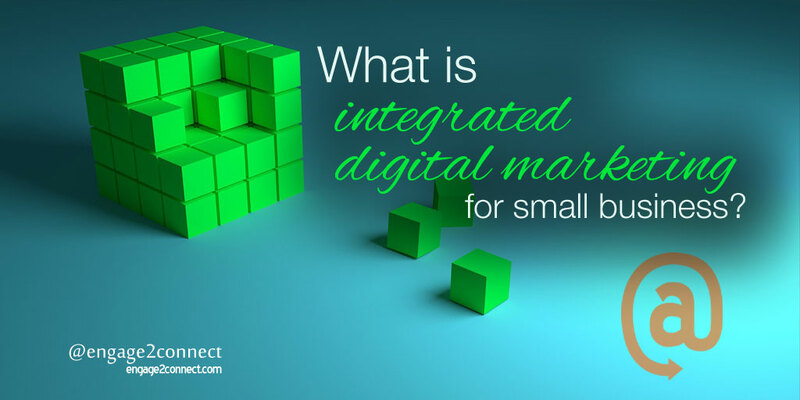 Integrated digital marketing for small business requires a deeply rooted strategy that connects each of the various properties, platforms and networks together around extremely specific goals, messaging and funnels. Let’s be a little more specific. The “Who” Of Integrated Digital Marketing – In order for a true integrated digital marketing strategy to be deployed effectively for a small business, the critical question of who must be answered. Within an effective strategy, which is at the core of an integrated marketing program, a small business needs to clearly define who they are trying to reach and this has to be done with clarity and specifics. If you are going to create a truly integrated marketing strategy, you must be able to answer who you are trying to reach. In other words, if you believe that your small business target customer is “everyone”, there is nearly no possible way you can execute an integrated marketing program online. The fact is, there is likely three to a maximum of five persona types that make up the real customer for your products and services. Breaking these persona types down into gender, age, income, personality traits and interests are crucial to developing a strategy. The “What and Where” Of Integrated Digital Marketing – For digital marketing to be integrated there are two additional things that need to be evaluated, strategized and executed related to the what and where questions. What platforms, properties and digital components are needed: Knowing where your target customers are spending time online is crucial to determining where you need to have a digital presence. What content and tactics need to be generated: Knowing the type of content you need to curate and create across the digital landscape, and more importantly how to connect it with tactics that make each component and piece of content work together makes all the difference in integrated digital marketing. The “When” Of Integrated Digital Marketing – Knowing what to do and where is just the beginning. Integrated digital marketing is a culmination of these things, PLUS understanding when to do certain things and how frequently they should be done. For a small business today, integrated digital marketing is a must. Not only are you competing with other local businesses, but you are also competing against other people, businesses and competitors around the world for your customers time and attention online. If your small business is not strategically and effectively using integrated digital marketing, you will undoubtedly struggle against the wave of content, competition and distractions that are vying for your customers eyeballs. Integrated digital marketing is about utilizing your website, search, social media, content marketing, email marketing and other marketing components in a highly strategic manner. When your digital marketing engine has these multiple components that are integrated well, they work off of each other to build stories and value. By properly integrating a digital marketing strategy across your entire digital presence, you meet the customer’s need with a purchase journey that produces experiences that they value. How well are you integrating your entire digital marketing program?